NAIROBI, Kenya (CNS) — Kenya’s Catholic bishops, urging citizens to remain united, asked the government to beef up security, especially in all educational institutions, and to address the breakdown in its intelligence system. 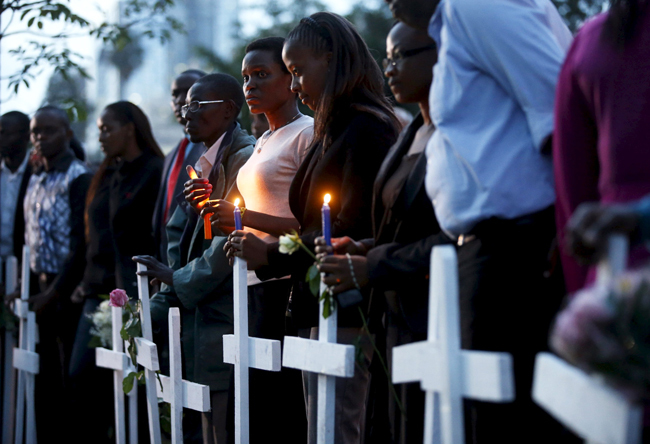 “It is saddening that many Kenyan youths are being radicalized to commit acts of terrorism against their fellow citizens,” the bishops said in a statement dated April 8, six days after the attack by the Somalia-based al-Shabab militants. “We all need to join efforts and embrace a spirit of nationalism and patriotism among all of us. It is unfortunate that some terrorists are living among us yet we are not reporting them to the relevant authorities. We need to respect the dignity of all,” they said. Kenya has seen an increasing number of terrorist attacks since 2011, when the military joined an operation against al-Shabab. The bishops said it was time for the nation’s institutions to ask how they should respond. The bishops’ statement was signed by the conference president, Nairobi Cardinal John Njue. On Easter, the cardinal called on worshippers to commit themselves to praying for peace and security in their homeland. After reading a message of condolence from Pope Francis to the congregation at Holy Family Basilica in Nairobi, Cardinal Njue urged worshippers to commit themselves to praying for peace and security in the country. “We need to constantly invoke God’s name, following common attacks in the country by the al-Shabab militia group, including the most recent one at Garissa,” the cardinal said. “In union with all people of goodwill throughout the world, His Holiness condemns this act of senseless brutality and prays for a change of heart among its perpetrators,” said the pope’s message in a statement sent by Cardinal Pietro Parolin, Vatican secretary of state. Cardinal Njue said the assault shocked the bishops and, in particular, Bishop Paul Darmanin of Garissa. “I have assured the shocked bishop of the bishops’ support, through prayers and any other (means),” Cardinal Njue said. He reminded Christians that Christ was persecuted and suffered for the sake of people’s sins, and he told them never to give up, even in the face of terror. “We as a nation are (facing) many challenges, and we must remain fixed to things above. Let us pray for the families and victims of (the) Garissa terror attack, and let their dead be a meaning to us,” Cardinal Njue said. The cardinal called for a global response to terrorism and urged Kenyans not to look at the Garissa massacre through a religious lens. “Even in the wake of the insecurity in the country, we must remain united and not give a few people the impression that this is a war between Christians and Muslims,” Cardinal Njue said. Contributing to this story were Francis Njuguna and Walter Cheruiyot.